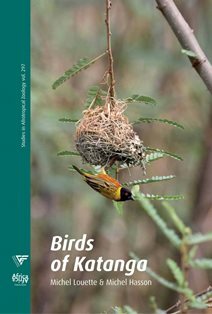 The Lufira Masked Weaver Ploceus ruweti breeding male has a black head and a strong chestnut wash on the breast and flanks, which distinguishes it from the Lesser Masked Weaver, Southern Masked Weaver, and Katanga Masked Weaver. It is also similar to the Tanganyika Masked Weaver but the black on the head of the Lufira Masked Weaver extends as far as the hind-crown. The female Lufira Masked Weaver is greenish above, dull yellow below and shows two wingbars. 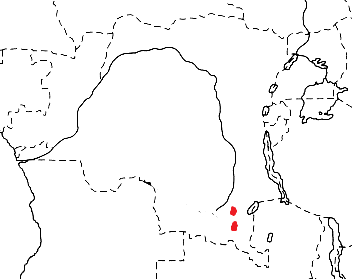 The Lufira Masked Weaver is found at Lake Tshangalele (formerly Lake Lufira) and Kiubo Falls, c. 120 km downstream on the Lufira River, in DRCongo (see map below, based on Birds of Africa and recent information). 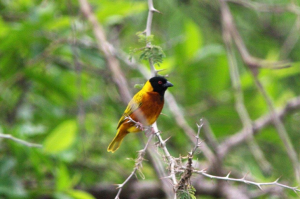 The Lufira Masked Weaver inhabits riverside vegetation, but nests in ambatch and acacia trees, rather than in the reeds. The diet of the Lufira Masked Weaver is seeds and insects, and the young are fed on insects. The Lufira Masked Weaver is probably polygynous. Males are territorial and usually have 4-6 nests, but may have 3-20 nests in some sites. The nest is oval, with the entrance below and little or no spout. The nest is woven by the male from strips of material, and suspended from branches above the water. Two colonies were close to nests of the wasp Ropalidia cincta. One clutch had 2 eggs, very pale green with brown spots, and spots concentrated at the thick end. Nothing else is known about its breeding habits. There are no PHOWN records for the Lufira Masked Weaver (see PHOWN summary), and many are needed. Submit any weaver nest records to PHOWN (PHOtos of Weaver Nests) via the Virtual Museum upload site.